Trying to find your missing objects in Cinema 4D? Here's why certain objects might not be visible. You might be chugging along in Cinema 4D when you come across something that isn’t quite right. For some reason or another, there’s been a change in the Matrix and now, you aren’t able to see your objects in Cinema 4D. It can be a real chore trying to fault find why an object can’t be seen, either in the viewport or in a render. Hopefully this little troubleshooting checklist can bring some clarity. You can follow along with the rest of this article using a scene file that contains the models I used to create this fun little gif. Free low poly delivery truck scene for you to follow along with! 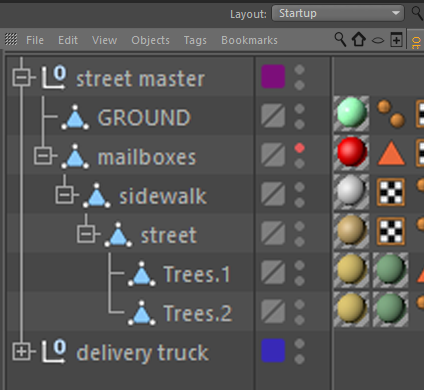 An object’s “traffic lights” are the tool used to control its visibility in the viewport and in the render. (red = off, green = on, grey = default or inherit behavior from its parent object). Of the objects you see here, which will you see in the viewport & the render? See the answers at the end of the article! 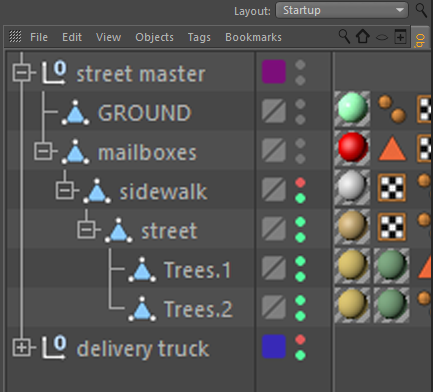 The layer manager is a great organizational tool for grouping sets of objects together. Don’t confuse these as 2d/3d layers or anything that deals with stacking or spatial information. Instead think of them like labels in Gmail: category labels that you can easily add to object and then filter and sort. Assign all your lights to a layer and all your scenic objects on to another layer, for example. They’re like what the traffic lights do for individual objects, but on a global level. And this is where you can shoot yourself in the foot. If you can’t see your object in Cinema 4D even though your traffic lights check out, you’ll want to see if that object is assigned to a layer & if so, if the layer’s visibility is disabled too. This one tends to catch people off guard who are working with extremely small or large scene scales. As a general rlue of thumb, it’s always a good idea to work in real world scale. But if you aren’t (or inherited a project that doesn’t) you’ll likely come across this issue in the viewport where as you move the camera, your object begins to partially or completely disappear. This is a result of view clipping, where if an object falls outside of the near & far distance of the camera, the viewport will simply stop drawing it. Under the project settings > view clipping you can change the setting according to the size of your scene with the dropdown presets or entering custom near/far distances. Normals indicate the direction a polygon is facing. If you’re dealing with editable geometry, your polygons could have reversed normals (ie. polygons facing inward to the object rather than outward). Cinema 4D has a viewport feature called backface culling which tells the viewport to not draw any polygons that are facing away from the camera. So, if your object has reversed normals and backface culling enabled, you might not see your complete object in the viewport. Simply ensure that all your object’s polygons are facing the right way and disable backface culling. Are normals reversed? Is backface culling on? One reason you can’t see your object in Cinema 4D is it could simply be out of frame. Cinema 4D has a handy tool that lets you visualize where the off-screen object is in relation to your camera. 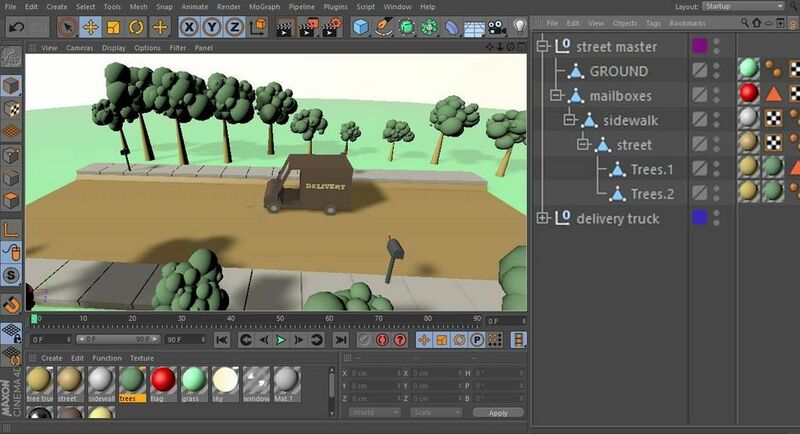 If your object is selected in the object manager and out of the current field of view, C4D draws a blue arrow on the edges of the frame to let you know where the object is. To move the viewport camera and frame up the object, make sure your object is still selected in the object manager and hit ‘H’ on the keyboard. Look for the blue arrow for out of frame objects. Another possibility in the fault-finding process is to check the object’s material transparency. An object with transparent material appears in the viewport with a ghosted, semi-transparency but when rendered, can disappear completely depending on the transparency settings. Check to see if your object has a display tag associated with it. If it does and the visibility on the display tag is set to 0%, you won’t see it drawn in the viewport or rendered. Are any of your parametric objects turned off? Any of the blue icon primitives or green icon generators will have a green check (enabled) or red X (disabled) next to these ‘live’ objects. Objects made editable won’t have these. And now the moment you’ve all been waiting for… the pop quiz answers. Could you tell what’s visible just looking at the traffic lights in the object manager? Often times if you can’t see your object in Cinema 4D, it’s inadvertently due to one of the factors listed above. Sometimes an object isn’t visible because you genuinely deleted it from the object manager (probably on accident right?). In cases like this, it is always a good idea to work with a safety net like turning on auto-save. An even bigger tip is to work with files that are saved to cloud storage like Dropbox. Dropbox will auto-version your file periodically and you can restore any of the previous versions should your scene file go corrupt or something like that. Ok so now that you know the tricks, let’s go make some magic!